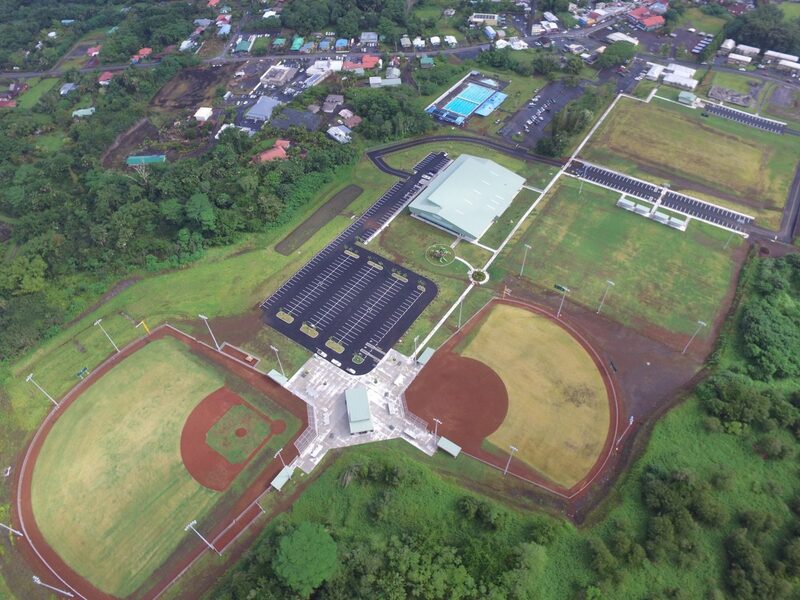 Pahoa Park Master Plan, Phase I – Pahoa, Puna on the Island of Hawaii | | Nan, Inc. 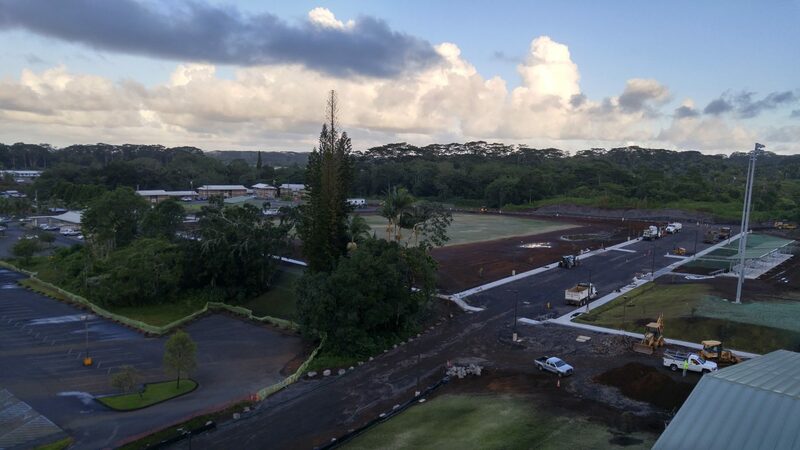 This project generally consists of the demolition of the existing AC runway, and tennis courts, & grading; construction of new paved roadways, paved parking areas, tennis courts, fencing, concession, comfort station, covered entry to existing events pavilion, interpretive center, hana no‘eau halau, sewer system, landscaping including trees, ground covering, grassing, water irrigation system, and other incidental related work. 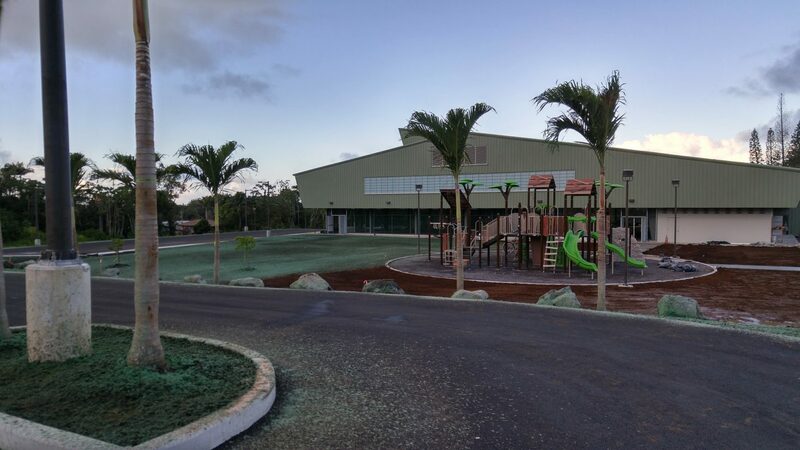 Site construction (selective demolition, removal and relocation, patching, clearing, earthwork including Geo report, termite control, soil treatment for vegetation control, piped utility materials and methods, drainage, drainage structures, grouted rubble masonry/rubble paving, sewer system, athletic and recreational surfaces, chain link fences and gates, irrigation system), concrete (concrete reinforcement, cast in place concrete, special concrete finishes), masonry (concrete unit masonry, stone masonry), metals (structural steel, cold formed metal framing, metal fabrication, architectural metal fabrications), wood, plastics and composites (rough & finish carpentry, solid polymer fabrications), thermal and moisture protection (building insulation, standing seam metal roofing, fiber cement siding and soffit panels, thermoplastic membrane roofing panels, sheet metal flashing and trim, joint sealants), doors and windows (hollow metal doors and frames, wall and ceiling attic access doors and frames, aluminum windows, tubular daylight devices, finish hardware, glazing, louvers and vents), finishes (painting), specialties (toilet compartments, toilet accessories, signage), special construction (grandstands and bleachers, hazardous material remediation, removal and disposal of asbestos containing materials, lead hazard control, arsenic hazard control, removal and disposal of PCB containing ballast and mercury containing electrical equipment, air monitoring/clearance testing), mechanical (insulation of mechanical systems, plumbing system basic materials and methods, plumbing fixtures and trim), electrical (grounding and bonding, hangers and supports for electrical systems, electrical identification, conductors and cables, raceways and boxes, panelboards, low voltage transformers, interior & exterior lighting, exterior athletic lighting, electrical vehicle charging station).